This is definitely our very top self catering property - there is nothing that Carole and Simon haven’t thought of. Views, fantastic welcome pack, most comfortable bed ever and just luxurious barn. We loved it and have booked our return. We are really flattered you enjoyed your visit so much to consider Shepherds View one of your favourite places. Look forward to seeing you again later in the year. No doubt you will bring the good weather with you again! We are really pleased that you had a great stay and really appreciate the time you have taken to review your visit. Please do visit again as there is so much more to see in this lovely and less known part of Cumbria. On our arrival we were met by the owner Carole who gave us a tour of the accommodation. As soon as you walk in you immediately see why they have a five star rating, from the luxury bedding and furnishings to the jacuzzi bath, everything has been thought of to make your stay as relaxing as possible. The views from the building are stunning and sitting in front of the picture window with your favourite tipple is highly recommended. When you do eventually drag yourself away from the luxury accommodation you're not disappointed as there are loads of walks for you to enjoy, maps and descriptions provided. A meal at the village pub is also recommended. Our stay from start to finish was perfect and this is definitely one of the best places we have ever stayed. Highly recommended. Thank you for your lovely comments. We are really pleased you had such an enjoyable stay and we are immensely flattered that you feel this is one of the best places you have ever stayed in. Hope to see you again in the future! We are really glad you enjoyed your stay so much and hope to see you both again soon! 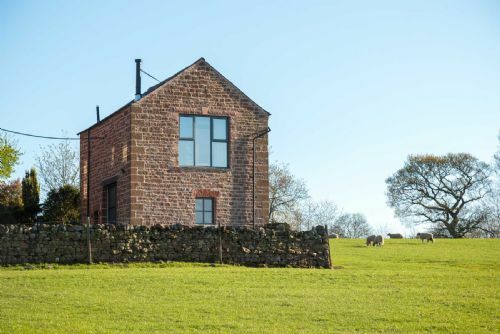 Shepherds View is the perfect place to experience countryside views from a luxurious vantage point with instant access to lavazza espressos and a warning log burner. We are really glad you enjoyed your stay so much and made the most of your break. Thanks for taking the time to review. I cannot speak highly enough of Shepherds View. The accommodation has been completed to the highest standard yet maintains a homely feel that allows you to relax and unwind after a day of walking. We truly didn’t want to leave!! Thank you for your lovely comments. We are delighted you enjoyed your stay so much and please return when time allows. Hopefully you are revitalised for 2019! A prefect base for a relaxing break in a village setting that's easy to get to. Every comfort has been thought of and the welcome basket is a generous treat. The hosts are charming and helpful without being intrusive. We wished we could have stayed for longer. Stunning views and a range of well marked walks with maps and information provided at the cottage. Acorn Bank Gardens (NT) is well worth a visit and is only 15 mins away. The best place we have ever stayed! The absolute best property we have ever stayed in. That's saying something as we have been fortunate to have visited some pretty amazing places around the world! Shepherds View is luxurious, wonderfully relaxing and beautifully located. It is situated in the lovely Eden Valley and close to amazing places such as High Cup Nick, Ullswater, Derwent Water & the Lake District to name a few. This means it is the perfect place to stay if you intend to visit these amazing sights and want to easily travel around. Carole & Simon are wonderful hosts and made us feel extremely welcome throughout our stay. They have thought of absolutely everything in Shepherds View to ensure you can escape from the real world but feel like you are at home. The cleanliness of the property is second to none and it is very well equipped with a massive comfortable bed, Smart TV with netflix, fantastic modern log burner and an immaculate jacuzzi & bathroom to name a few things. The kitchen is well equipped and if you are wanting to cook they provide everything you need to self cater too. We are quite fussy and I can confidently say that Shepherds View actually exceeded our expectations. We loved this place so much that we were sad to have to leave and get back to the real world. There is no doubt we will definitely be back. Thank you. Thank you so much for such a wonderful review. We feel privileged that you were able to enjoy yourself so much as this was always our vision for our guests. The Eden really is a perfect place to visit as you describe, and we are delighted that Shepherds View exceeded your expectations. It is a super place to stay, everything had been thought of to make the stay very relaxing indeed! Thank you. Thank you for taking the time to write a review. We are really pleased you found the barn so relaxing and enjoyed your stay so much. Lovely warm welcome from owners who were knowledgeable about the area & on hand to help with recommendations if required. Spotlessly clean, furnished & equipped to a very high standard with everything you need for a self catering break (+ little extras like a yummy welcome hamper). Spectacular views & wonderful walks straight from the door (it was great not having to use the car every day). The area is unspoilt & quiet without the crowds you find in some other areas (we walked for 3hours without seeing anyone else). Close to Appleby for the essentials but there are loads of pubs and cafes around if you prefer not to cook (including a pub within walking distance of the cottage - but far enough away so that you don't get any noise). Will highly recommend & would love to return. Thank you very much for your kind words. It is always good to know when guests have enjoyed their stay, and you have summarised perfectly what we like about the area! We stayed here recently and loved the comfort and quality of this lovely barn. Although we were out quite a bit most days we looked forward to returning to the barn as it is warm and cosy, tastefully decorated and very well equipped with fabulous fixtures and fittings. Carole and Simon are wonderful hosts and have obviously worked hard and put a lot of thought into creating Shpeherds View. We wanted for nothing while we were there. We will definitely be returning and I can’t recommend it highly enough. Thank you for your kind comments. We are really pleased you had such an enjoyable stay and made the most of your time in the area. We were very comfortable in Shepherd's View with its superb view of the Pennines. It had all the amenities required for a 5* stay. We were very pleased and its an ideal spot for hill walking. We had a fabulous week and will definitely return. The standard of the accommodation is very high and we can completely understand why they got 5 star gold! We have stayed in many places all over the world and this Cottage is one of only a handful of places that we would happily return to. Excellent in every way and we can wholeheartedly recommend this property to others. Me and my boyfriend stayed here in August 2018 for 3 nights. The Barn is beautiful, exactly how it looks in the pictures, and we thoroughly enjoyed our stay. When we arrived we were greeted by Carole and Simon, and they gave us lots of information about where to go, and what to see whilst there. They were both lovely, and really accommodating. This was exactly the sort of place we were looking for, and we were amazed at how modern everything was. It's always nice to stay somewhere homely, and we definitely felt comfortable during our stay. We loved the hamper filled with local produce. We will definitely be returning, as there was so much we didn't get chance to do/see. A great find! Wonderfully situated. A tastefully appointed little get-away. Very thoughtful owners. Just what we were hoping for. A fantastic property in an idyllic location with to-die-for views over the fells. 10/10! Thank you for your kind comments. We are really glad you enjoyed your stay with us. We had an amazing stay, and Carole was really helpful both before we arrived and once we were there. The place is absolutely lovely, and we couldn't have asked for more.